“Mercury recording artist Mr Hudson this afternoon announced on his twitter page that London rap artist Stylah has won the competition to feature on the UK edition of his new single Anyone But Him. The song, which features Kanye West on the original album version, is due for release in May with Stylah guest featuring. 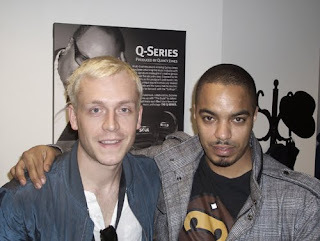 Stylah will also be joining Mr Hudson on stage to perform the track on his current UK tour. Whilst my view is that you should keep Mr Hudson well, well away from Jay-Z, it’s good to see that he’s offering his hand to people over here. But then they will inevitably end up making music I can’t get with. Congratulations to Stylah, who’s been putting in work with Poisonous Poets and as a solo artist for a long time now; hopefully this will lead to new opportunities for him. Check the result and a video of them in the studio over at Stylah's spot. I honestly don’t think any collaboration would surprise me these days, except maybe Chester P and Sugababes.